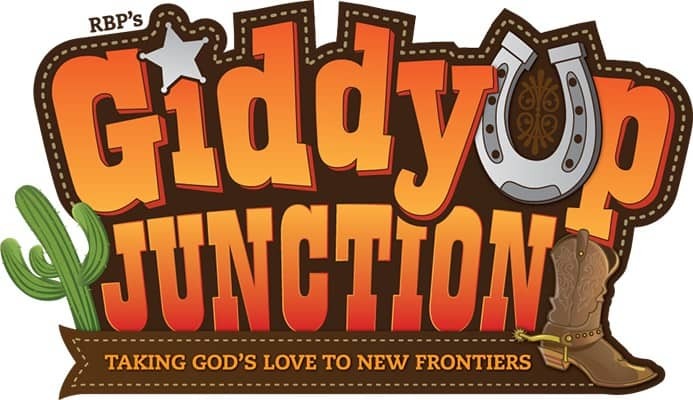 GiddyUp Junction is a new 2019 Vacation Bible School theme from Regular Baptist Press. They are one of the website sponsors s and sent me this review copy. So this is a first look at the material, I’ll add more as I check it out in detail. As you can see, this is refresh of the classic western or cowboy themed VBS. At first look, you can see they have done a great job with the graphics and put out a nice looking curriculum. You can also hear some the western flavor in their music (listen on their website). They are one of the few evangelism first programs still one the market. This program is designed to tell kids the good news and ask them to respond by accepting Christ. Some publishers are shy about telling kids how to respond to the Gospel. Each church will handle child evangelism a little different (ask your pastor if your not sure) but this program makes it a real focal point. RBP VBS is The Evangelistic VBS. Another distinctive, they offer King James Version as an option on all their curriculum materials. If your church is more comfortable with the using KJV for teaching and Bible memory, this program will not disappoint. I’ll be adding more details over the next few weeks as I read through the material, so be sure to check back if you are undecided about which VBS 2019 program you like. Better yet – dig into their website and decide if this is a good firt for your church. The official website has full theme details, including daily Bible lessons, music samples, and how to order. ** Thanks for all the great comments. The giveaway on this post is complete and the winner has been notified by email. Congratulations Mary! That looks so awesome!! I teach 3-5 year olds, also help out with 6-12 year olds in my church Sunday school. It has a fun theme that the know ds would love. I can’t wait to let the kiddos see it. God bless you all for such a heart for children. We are going to do our first vbs this year and this looks like a great idea! Our church is trying to re-invent VBS this and Giddy Up Junction seems like a great start. I believe the children would love it. This is a great idea for learning God’s word. We just did Cowboy Ninja Day and the kids had so much fun with the western theme. This would be great to start with. We would love to use this at our church VBS in June! Having all the material layed out for you helps reduce some of the stress of planning an event like VBS. Not having to buy the kit would increase the amount we have to spend on the kids resources! We are a Cowboy Church in deep Southeast Texas and this looks like something that our Buckaroos would really enjoy and could relate to . Learning about our Lord and his love in a western theme. Great ideal. This is an awesome idea to teach the kids in our church aged 3 years old to 15 years old.The children will love this! That looks so awesome!! I teach 3rd thru 6th grade in my church Sunday school. It has a fun theme that we know the children would love. I can’t wait to let the kiddos see it. God bless you all for such a heart for children.Our Church would love to use this at our VBS Having all the material laid out for you helps reduce some of the stress of planning an event like VBS. Plus not having to buy the kit would increase the amount we have to spend on the extras that make VBS so much fun for the kids. looks like an awesome VBS!! GOD BLESS U SIR, THIS A GOOD JOB, MORE WISDOM SIR, I LIKE USING THIS BECAUSE THE LESSON IS ACCORDING TO AGE. THANKS BEST REGARD TO CHILDREN MINISTRY AND OUR FATHER. That is a great idea and the kids will surely enjoy and be refreshed with this cowboy style. Another frontier to learn. This looks like what we need for our vbs this year because we want to build the children in the word of God. I know the kids will love it because we did western themed vbs like “Sonwest round up ” and they enjoyed it much. This would be a wonderful vbs for our church! This would be such a blessing. So nice, it looks very interesting and fun! This looks to interesting. We are trying something different with our VBS this year (considering holding it at a campground site) and I think this would tie in with the out door surroundings, plus I love the themes and how well they are presented sticking to the gospel. Our church is going to do this VBS and we are super excited. WE love RBP materials, they are indepth, very strong evangelistic message and fun. That’s a lot of material. Our youth group would love that theme. Looks really great. I attend a new plant Cowboy Church. This is a theme that not only could we use for a VBS but, also for our Cowkids Children’s Church. The idea that the gospel is presented clearly is great. I also think that the kids will like the cowboy theme! Thank you for showing this program. I have always loved RBP material for VBS. Very evangelistic. I also appreciate how their music is not wild like in some programs. The western theme always is a hit with kids. I like this one because it has classes for all ages, not just for the littlest kids. This will be the first time that I will be the director of our VBS. (Last year no director, no VBS :( ) I would like to win this set because we are a small church and do not have a large budget for VBS but we are located in a low income area and the kids always enjoyed our previous events. Thank you for sharing. the VBS material you are showing looks like it going to be a lot of fun. We are a new ministry( small for now) and would love to win. This looks like fun for all ages and it would be nice not having to plan a curriculum. With all the materials being put together for you would help reduce the stress of hosting VBS. This VBS is the one we’re strongly considering for this summer! This Giddyup junction would be good for our children church. Our last Christmas program was country based and the kids loved it. I would love to use GiddyUp Junction at our church. We have been going through some tough financial times and last year used all free curriculum. It would be awesome to surprise the kiddos and families with this awesome week of fun and learning. We love RBP material because it comes in KJV! Love the way they share the gospel in every lesson! Excited about this VBS! Fun theme for the kids and easy to decorate for!! We are a small church in beautiful Northwest Montana. I think our kids would relate well to the “Giddyup Junction” theme. I like the idea of so many age groups being represented in the material. Our budget is small so if we had the opportunity to have the Introduction Kit at our disposal, we could spend that money on making this one of the BEST VBS experiences in our little town. Thank you for the offer! I am the VBS Co-Director for The Gateway to the High Country Cowboy Church in Clark, Missouri. We are a small cowboy church. This year, 2019, will be our third year for VBS The first year we had about 20 kids and last year we increased to about 40 kids. We are associated with helpers from the Southern Baptist Association and have used Life Way for our VBS. Last year was Game On and as the co-director I tried to make all the crafts, activities, and snacks cowboy related. For example in crafts we made a table top horseshoe game, in recreation we rode stick horses, used pool noodles and balloons to play Polo and for another day in recreation we had one of our church members bring in her horse for demonstrations, and then in snacks we had drinks at the watering hole and one day for snacks we fed the “horses” (kids) vegetables with dip. We are looking forward to another successful year for VBS and hope our numbers continue to grow. Having a cowboy theme would be wonderful for our small cowboy church. Our youth would love this fun Western theme VBS and it would help me as a new director tremendously! Thank you for the great idea, and opportunity to win. This looks great! Our rural Cowboy Church will have our third VBS this year and we have allot it excitement and enthusiasm! Each year we have grown in numbers of kids and volunteers! And of course, we include horses! This VBS looks interesting. Even the adults classes can relate to it. We have adults classes too. Is there a teacher’s guide for adults? Would love to have to use this year. We rely on RBP every year for quality KJV materials with a salvation based approach. Hi Mary – We just ran the random drawing and your comment was selected. I’ll be sending an email to get your shipping information. Congratulations! Oh, man! This would be so awesome! I am a part of a small church with a small budget, so this would help out tremendously! We want everyone to hear the Gospel. I like that the curriculum goes as low as 2 years old and up to youth age. Many curriculums do not include youth. I want my youth to be part of Bible school as well. Hi Tony. Not sure if this is available to Canadians or not. We are a very small church with limited budgeting. I am blessed to have volunteers with great imaginations but this starter package would definitely be a blessing for us. This looks like exactly what our church needs to excite the kids. Even if I don’t “win” this starter pack is now on our list of possible programs for the summer. Thanks for doing this. God Bless! This is an exciting VBS program! Our church (First Church of God-Anderson,Indiana) is located in a small community (Newton, KS) and we have a large number of homeless persons including families with children. Many of families/persons are hungry for God’s Word.We have been praying for our children’s ministry outreach and this will be a wonderful opportunity for children to engage and learn Jesus’s life changing message. Thank you for offering up this awesome program! That looks like a great curriculum,Tony! We could/would definitely use that in our church! My husband and I are the kids church leaders and I also tech Sunday school. It would be a blessing to have a great curriculum like this to do a vbs this summer. Thank you for all you do! Thank you for offering this preview. I will having a backyard VBS this July. The materials have given me a theme for the young Texans in my Katy neighborhood. This would be awesome for our church kids! Our pastor raises miniature horses and others in our church have horses. I think this kit would fit right in with our young people! Thank you for the great work, we are blessed. My Sunday school kids are enjoying each bit of the lessons! Would love a chance at winning this kit!! Plan to do this theme for our VBS at Antioch Baptist Church this summer. Winning this kit would allow more money to be spent on decorations and craft supplies!! We have so many ideas already on how to decorate just by looking at introductory catalog we received in the mail!! Oh the possibilities and fun we will have!! Tony Kummer (Editor) reviewed & updated this page on : February 8, 2019 at 7:55 am. All our content is peer reviewed by our readers, simply leave a comment on any post suggest an update.